We had an intermittent engine control unit fault code on Dirona‘s John Deere 6068AFM75 that started shortly after we departed Kinsale, Ireland. Under higher loads or at idle when running the hydraulics, we sometimes get a 1347.7 fault code which indicates the actual fuel rail pressure is different from the called-for pressure. This occurs is when the called for and actual pressure differs by more than 750 PSI (the system usually runs around 18,000 and at times is up over 20,000 PSI). The actual pressure could be 750PSI high or it could be 750PSI low. But the code is almost always triggered by low pressure. 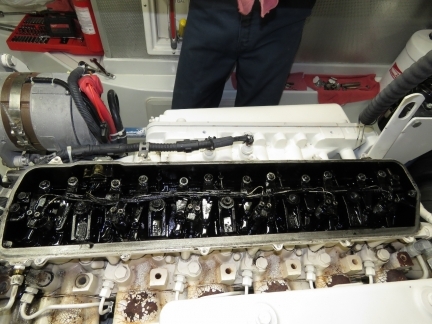 The engine was operating normally in all ways with full horsepower available, no unusual smoke, or any other external sign so it wasn’t having much impact on the engine’s capabilities. 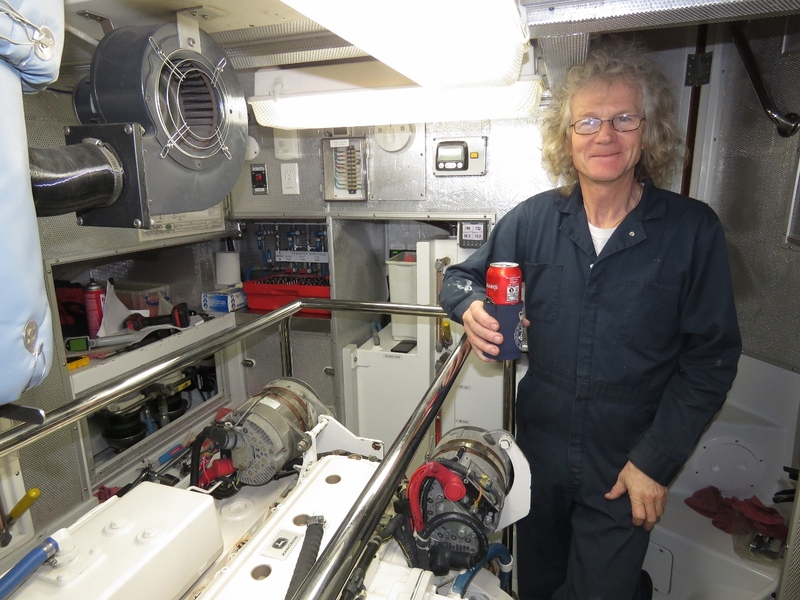 We’d been busy having fun, but did have some time on Christmas Day while we were in Falmouth, so we decided to open up the engine. We had already ordered all the parts we needed that we didn’t already carry, so it wouldn’t be a problem that all the stores were closed for a few days. Or so we thought. 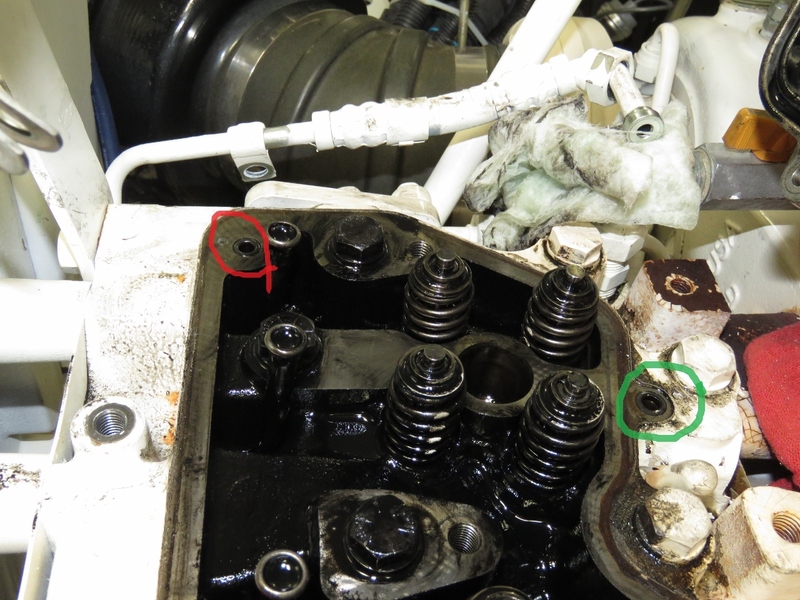 I’ve checked the suction control valve that is responsible for adjusting the fuel rail pressure at the high-pressure pump and the high-pressure relief valve and both are working as designed. At this point, the most likely explanations are 1) worn injectors or 2) internal leaks at the side tubes or injectors leading to excessive leak down and insufficient pressure under some circumstances. 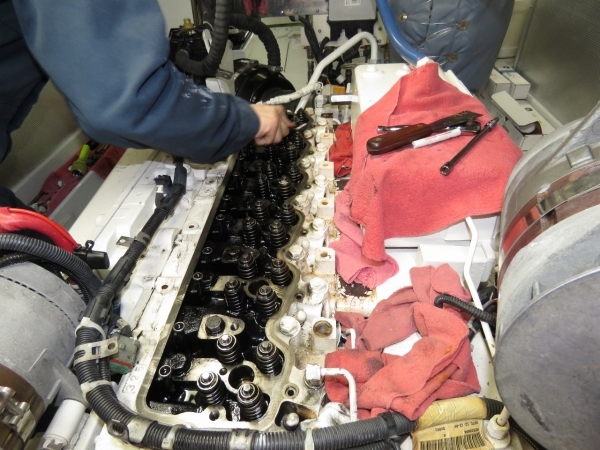 We also have a minor oil leak at the rocker arm carrier so since we’re working on this part of the engine anyway, we’ll also take off the carrier, rocker arms, rocker shaft, and replace rocker arm carrier gasket and O-rings, adjust the valves, replace the injectors, replace the rocker cover gasket and carrier. Since we had been planning to change the injectors on Dirona‘s John Deere 6068AFM75 for the past few months, we had already ordered all the parts we needed that we didn’t already carry. The parts we have to make the change are the rocker cover gasket and O-rings, rocker carrier gasket, and 6 new injectors. It’s now Christmas, around noon, and I’m looking at 8 hardened O-rings that I didn’t expect to need to change. In fact, I didn’t know they existed. We have a prodigous supply of O-rings aboard Dirona, but our 6mm O-rings are 2.0mm in diameter while these are 2.5mm. The O-rings we are missing are 6 O-rings to bring return fuel up from each injector to the rocker shaft carrier, 1 O-ring to bring pressure lubricating oil up from the cylinder head to the rocker shaft carrier and 1 O-ring to bring pressure oil from the rocker carrier to the rocker shaft hold down. It turns out the reason I missed these is that Deere 6068 engines mostly run these fluid flows through external piping but the 6068AFM75 and the newer 6068AFM85 use internal passages with O-rings. The O-rings do need to be changed, so we’re going to need to wait until the Deere dealers open after the holidays. It’s December 27th and businesses are now open again so we got on the phone first thing this morning calling John Deere agricultural dealers. The good news is they had the parts we needed, but the bad news is they’re about 45 minutes away by car, really not accessible by bus or train, and we can’t find any rental cars in Falmouth. Kate Humphries from Melbourne, Australia came to rescue. She had arranged weeks ago to come visit us while we were in Falmouth. Kate had a rental car and generously offered to drive us to the Deere dealer. Unfortunately the Hayle Bypass Google Maps directed us to was closed with no detour route set up. We generated new directions that ended up with our driving down progressively worse-quality roads until we ended up on a single-lane narrow road that actually crossed a running creek. And by cross a creek, we don’t mean we drove over a bridge. We had to drive through the creek. Up a hill on the other side, we encountered a plug of traffic also rerouting around the closed bypass. This single-lane road, that likely gets very little traffic at all, suddenly is the replacement for the four-lane bypass. Rounding a bend, we came nose-to-nose with a large van. Hard to know who should back up. 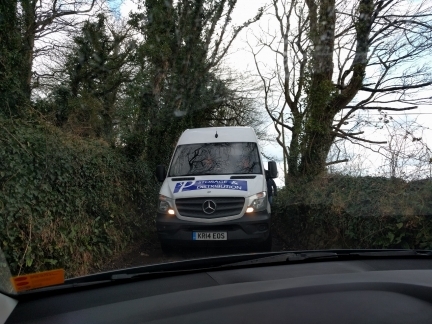 But a car showed up behind us, so we figured probably the van should back up. Then another van and several more vehicles showed up behind them. It looks like it’s us that is backing. We worked our way backwards down the narrow road to where there was a large-enough gap at the creek that we could be passed. James sprinted ahead on the road to stop any more traffic and Kate sped after him in the rental car. All this for a few pence worth of O-rings. 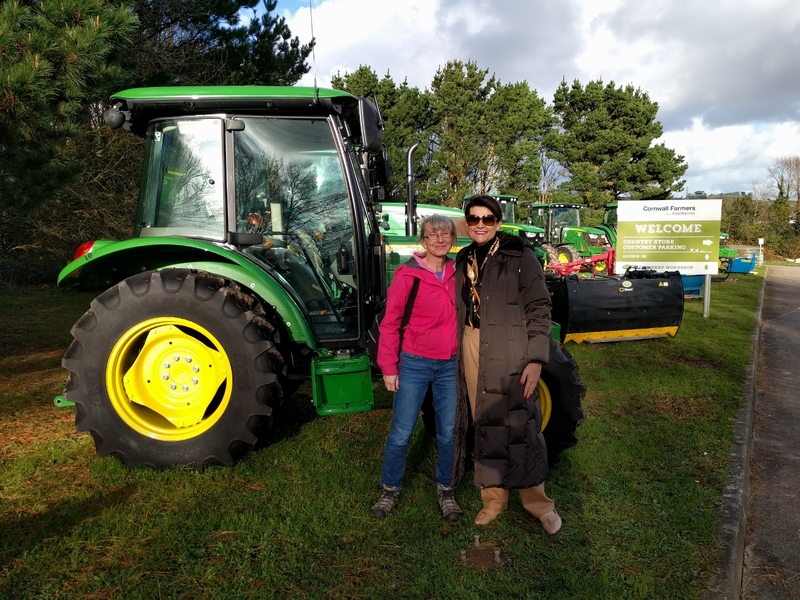 Kate Humphries and Jennifer outside the row of tractors at Cornwall Farm Machinery just outside Penzance. It was a bit of a goat rodeo getting here, but we finally got our parts. Time for lunch and a celebration. Cornwall Farm Machinery was a wonderful stop. Partly because they had the 8 O-rings we need to be able to put our main engine back together and partly because they place is full of great green tractors—better than a modern technology museum. 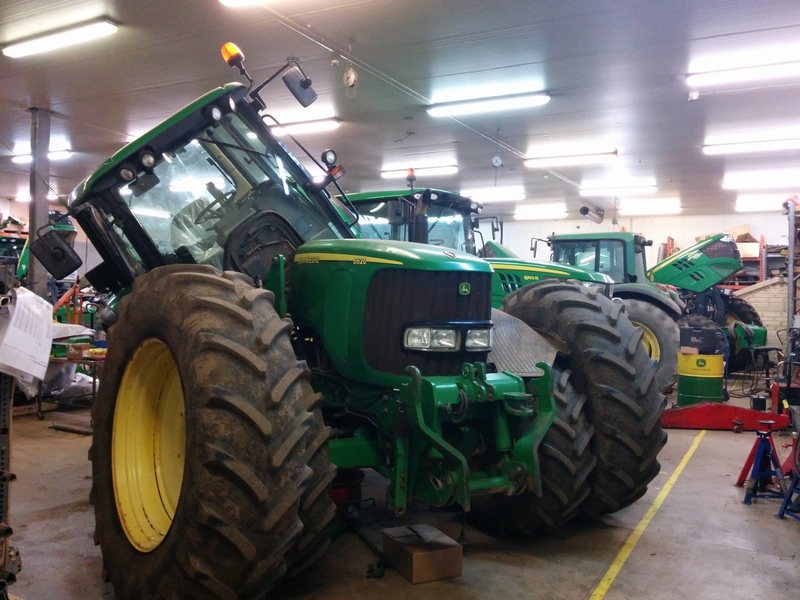 Almost all John Deere tractors working in the Cornwall area use the same 6068 base engine we have so there is no shortage of parts. The success of John Deere agriculture means there is almost always a dealer in area. Probably not a marine dealer but Deere skills are plentiful. 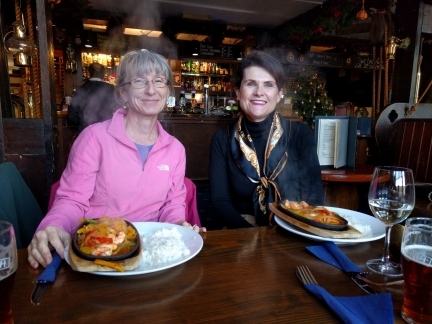 Sizzling shrimp at the Dolphin Tavern in Penzance with Kate Humphries. Kate had sent us pictures of Dirona in front of the iconic Sydney Opera House minutes after we had dropped anchor for the first time in Sydney in December of 2014. She came to visit us in Melbourne in March of 2015, but we haven’t seen her since. 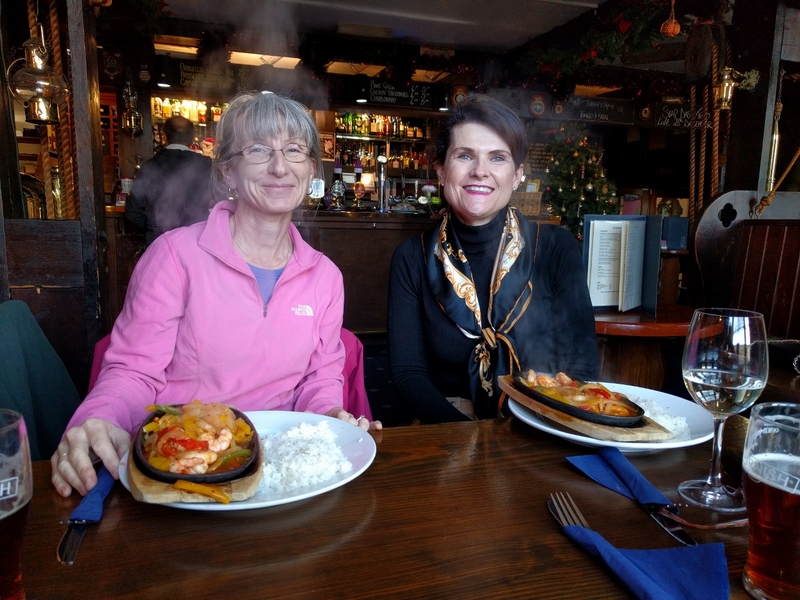 She happened to be in the UK visiting friends and it was great to be able to catch up half a world away. And, without Kate, our Deere might still be in parts in the engine room. Thanks Kate! Our Deere 6068 is now mostly back together, but the important thing is it starts well, runs well, sounds good, and smells good. After all this work, it’s fun to watch it slowly warm up as I get ready to put the rest of the parts on after a short “coffee” break. We’ll blog the details of the job.